Find hotel near Country Inn & Suites By C .. This property has an amazing location advantage for it is close to Candolim Beach, Baga Beach, Fort Aguada and Calangute Beach. So it completely depends on you, where and how you wish to hit the water when you stay here, for the options are many. Spa, outdoor dining, pool are the facilities you can look forward to while staying here. The rooms are big and decently decorated and the property might give you a feel of Portuguese culture. The staff is humble and polite. Your stay here will be comfortable and relaxing. Use Candolim trip planner to visit Country Inn & Suites By Carlson Goa Candolim and many others to your visit. Add comfortable hotels to your plan, choose from the recommended hotels in Candolim like Oyo 9217 Studios Near Candolim Beach, Resort Coqueiral and Oyo 9173 Walking Distance To Candolim Beach. Chalk out the best way to discover the city with Candolim vacation packages. Check out various modes for how to reach Candolim. How popular is Country Inn & Suites By Carlson Goa Candolim? 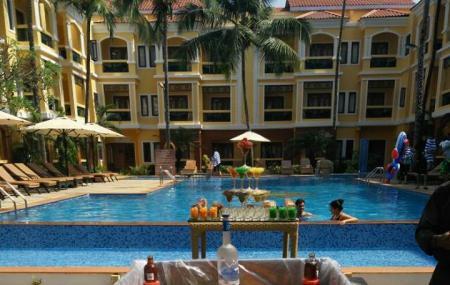 People normally club together Marquis Beach Resort and Morjim Beach while planning their visit to Country Inn & Suites By Carlson Goa Candolim. Stayed here this week. The staff is very courteous. The room was very specious will pool view from balcony. They had even arranged holi celebration at pool side. Definitely going to be my place to stay on next visit to Goa. Excellent place for weekend gateways and for business purpose also. Rooms are very spacious. Food quality is also good and for breakfast there are numerous stuffs, overall food is delicious and service is also very good. Nestled in the heart of Candolim, Goa. This hotel will offer the finest services to its guests. It creates a sense of security once you step inside and talk to to the staff. If you're hungry, needing a taxi, or find the most peaceful beach, they will go above and beyond and help you find what you need. Look no further in finding your "home" as this quaint hotel will cover you and your families need. Beautiful 5 stat property by Country Inn, went for dinner, live music and ambience was amazing and romantic. Staff was very cooperative and concerned about guests comfort.